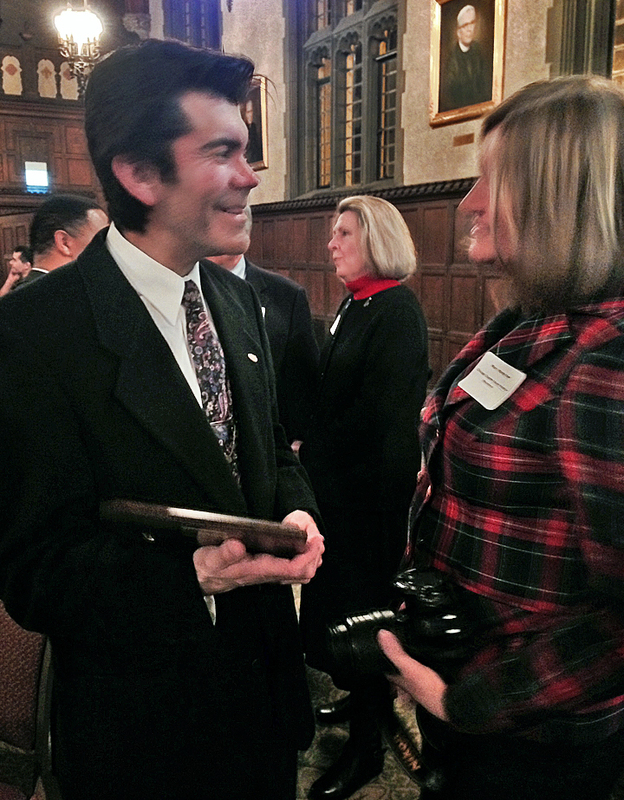 Elio Leturia talks to Chicago Chapter board member Mary Mares-Awe after being presented with the 2013 Dee Sarelas Service Award. 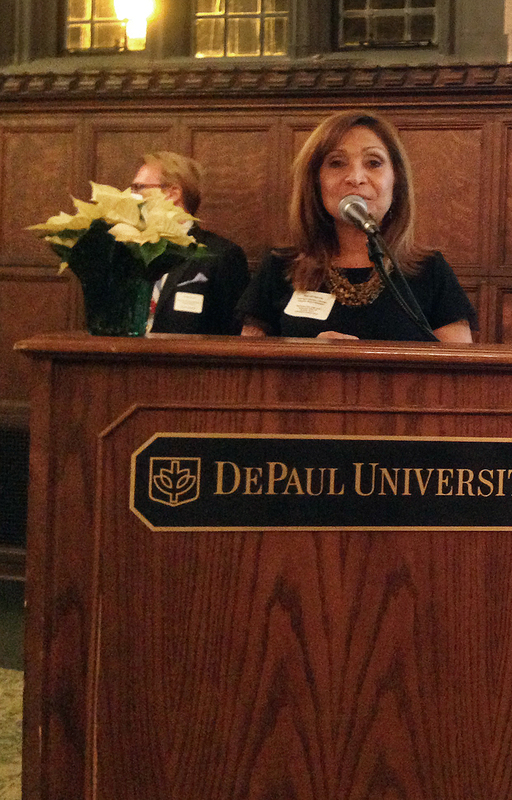 Past award recipient, Dr. Ana Gil García announces this year’s winner. 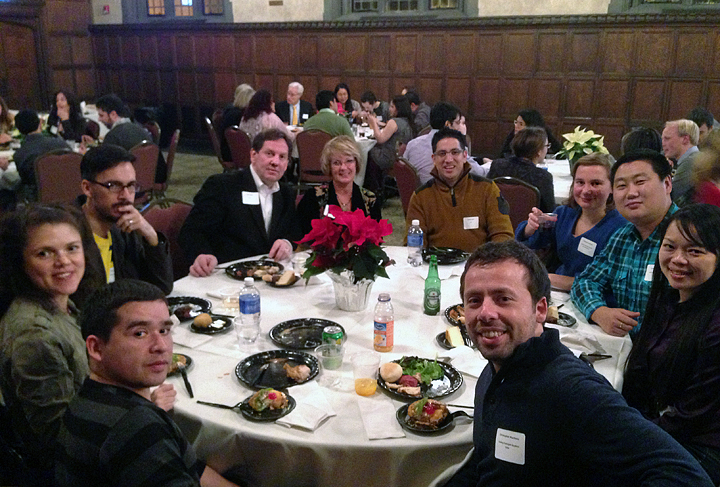 By Mary Mares-Awe—ELIO LETURIA RECEIVED the 2013 Dee Sarelas Service Award as part of the ceremonies at this year’s annual Fulbright Chicago Holiday Party on December 2nd hosted by DePaul University. Leturia was very honored and surprised for receiving the award, “I didn’t even know I was being nominated,” he said emotionally after receiving the recognition of distinction. Leturia is a worthy recipient of the award having devoted the past seven years to working hard at the Chicago Chapter of the Fulbright Association, and devoting countless hours to various Fulbright activities, including creating the Chicago Fulbright site and serving as a president of the Chicago Chapter for two consecutive years, 2011 and 2012. Leturia also designs Fulbright Edge, the monthly newsletter of the national Fulbright Association and has presented in the last two national conferences in London and Washington D.C. He has also organized a national training conference when presidents from more than 50 Fulbright associations in the country convened in Chicago last April. 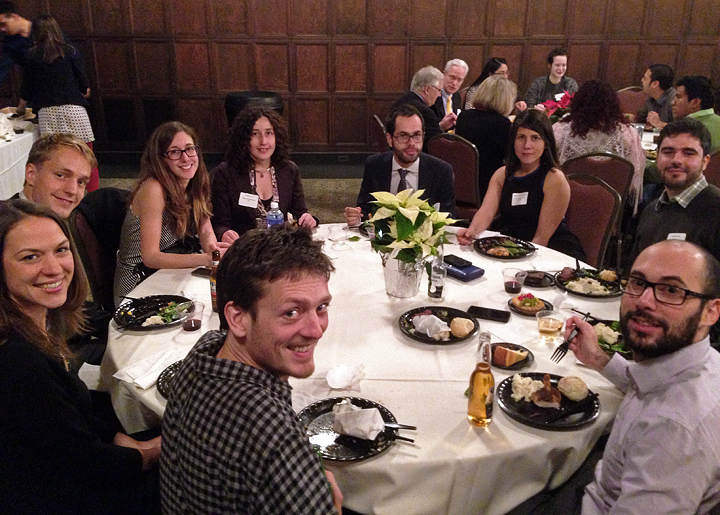 Currently, Leturia is the Vice President, and Communications Director of the Chicago Chapter. 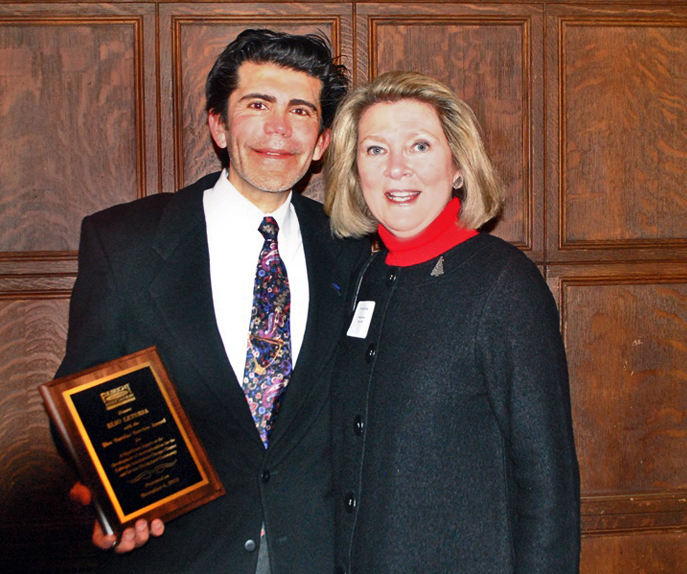 In 1990, he came to the United States as a Fulbright Scholar from Peru to pursue a graduate degree in journalism. Upon completion, he returned to Lima and eventually relocated to the United States hired by the Tribune Company. He has worked for years for the daily press and academia, and currently he is an Associate Professor in the Journalism Department at Columbia College Chicago. Don Garner thanks the association members for the recognition. 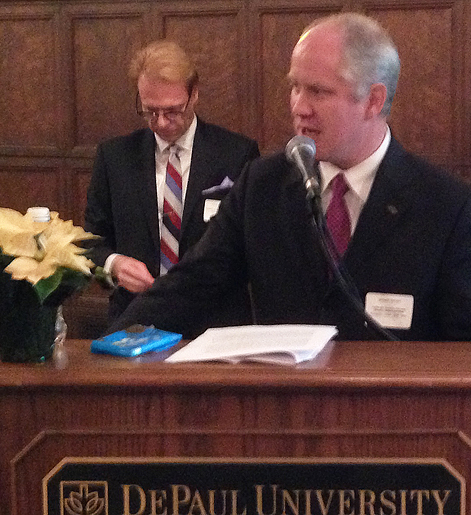 Don Garner, the Consular Corps Liaison board member and past-president of the Chicago Chapter, was also recognized this year for his outstanding commitment in connecting the diplomatic Chicago community with the Fulbright program. Previous winners have been Marilyn Susman, Thomas Ahleman and Ana Gil-García. 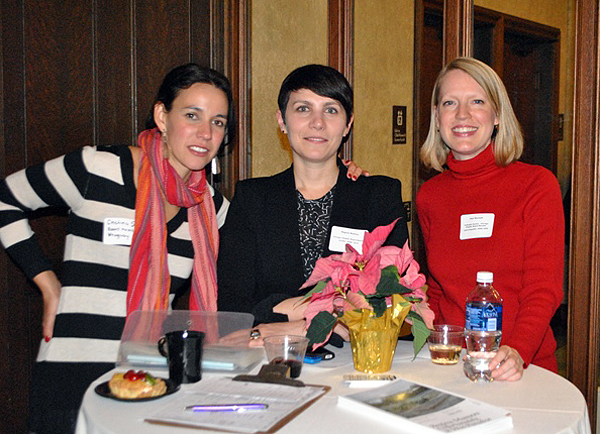 More than 110 guests attended this year’s Holiday celebration. 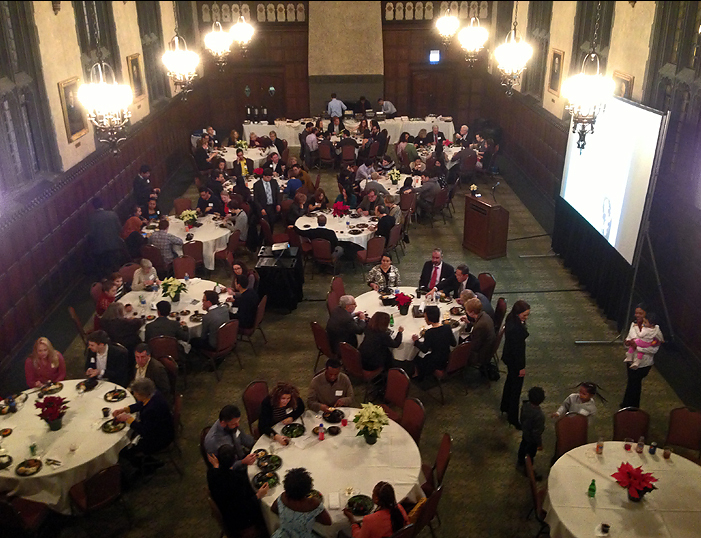 Participants included members of the Fulbright Association of Chicago, friends and family, current Fulbright students and scholars from 42 countries, and members of the consular corps including the Consul General of Japan, Hon. Yoshida Masaharu, the Consul General of Pakistan, Hon. Faisal Tirmizi, the Consul General of the Comoros in Chicago, Hon. 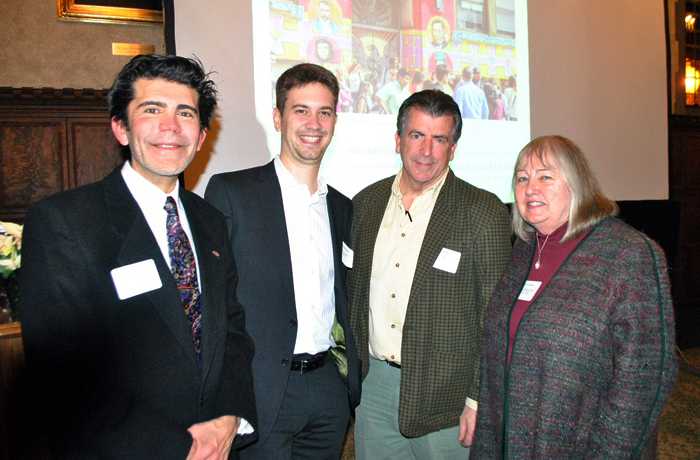 Charif Hachim and the Consul General of Uruguay, Hon. Nury Bazán de Senes. 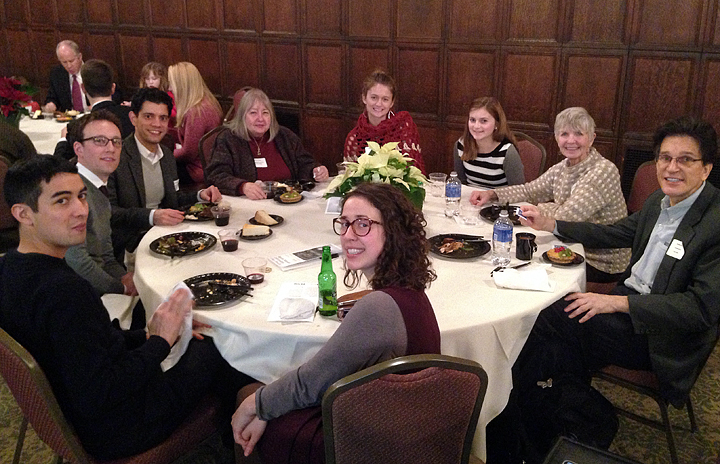 Guests enjoyed a buffet-style dinner served at the stately walnut paneled dining room of DePaul University’s Cortelyou Commons. 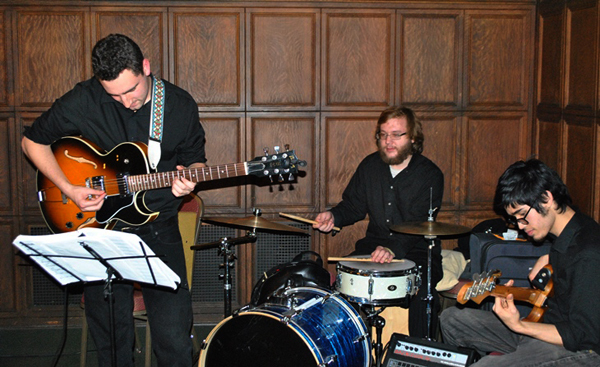 Entertainment was provided by a trio of Columbia College Chicago music students, who supplied professional-level jazz sounds throughout the evening. As part of the background ambiance, a photographic slide show showcased scenes of this year’s events and activities. Another slideshow set to the music of American composer and a fellow Fulbrighter, Aaron Copeland, showcased some 40 famous Fulbrighters including scientists, entertainers, country presidents, and historians. This entry was posted in Chicago events. Bookmark the permalink.